The new round of negotiations between representatives of the Colombian government and the FARC rebel movement began in Cuba. On Tuesday a delegation from Bogota arrived to Havana. Colombian President Juan Manuel Santos expressed his intention to accelerate the process of negotiations and conclude an agreement with the rebels until 23 March. The first round of negotiations was held in Oslo on 18 October 2012, consultations were then transferred to Havana. In the summer of 2013 negotiations had stalled, and Santos withdrew the Colombian delegation from Havana. The reason given was differences between the rebels and the government about the shape of a peace agreement. Bogota intends to discuss the FARC demands on a referendum, while delegates from the rebels demand to convene the Constituent Assembly, which will make amendments to the constitution of the country, according to the concluded agreements. 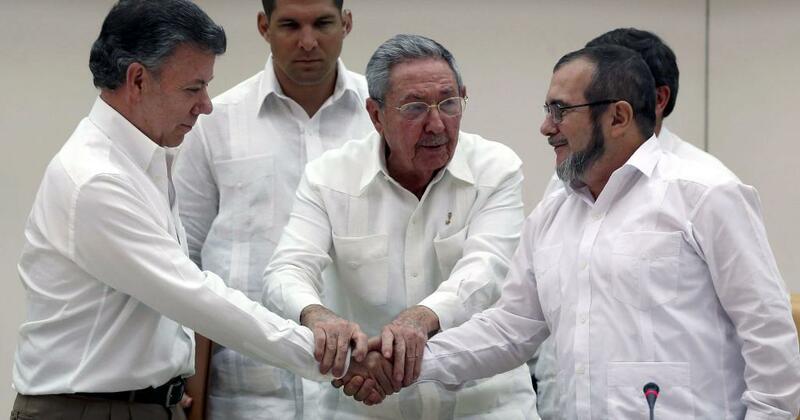 On 20th September 2013 negotiations resumed, and two years later, on the 23 September 2015, in the presence of Cuban leader Raul Castro, President Santos and the rebel leader Jimenez shook hands and announced their intention to sign a peace agreement in March 2016. The Revolutionary Armed Forces of Colombia - Army of the people, the FARC-EP (Spanish. Fuerzas Armadas Revolucionarias de Colombia - Ejército del Pueblo, FARC-EP) – is an ultra-left Colombia rebel group that, for half a century, has been fighting against the liberal pro-American government. In 2001, the US State Department proclaimed FARC as a terrorist organization, with the European Union later making a similar decision. Cuba and Venezuela insist that this is a guerrilla organization and it acts on the basis of the ideas of Simon Bolivar - a key figure in the national liberation movement in Latin America. FARC is controlled by a "secretariat" headed by a Commandant and six warlords. Up to 40% of FARC fighters are women. Data on the number and location of groups of rebels are constantly changing. In early 2010, FARC forces were present in 24 of Colombia's 32 departments, most of them bordering with Venezuela, Ecuador, Panama and Brazil. The organization has a developed infrastructure, including its own media – radio station “Voz de la Resistencia” (Voice of the Resistance). The heyday of “Voz de la Resistencia” came in the early 2000s, when the station was able to create a network of FM and medium wave transmitters throughout the country. Also, radio transmissions on shortwave could be listened in Europe. The station had successfully aired musical programs in Columbia, had a recording unit, and even processed audio discs. During Raul Castro's office, Cuba's role as a regional power has increased significantly. Having become an intermediary in the important US process of settlement of the conflict in Colombia, Havana essentially has broken the information and diplomatic blockade arranged by the hegemon and its satellites. The pro-American regime in Bogota, as well as the FARC, is interested in a peaceful resolution of the conflict. In case of successful negotiation and the signing of a peace agreement between the parties, Cuba will establish itself as a strong regional player, able to resolve conflicts and conduct an independent policy.